like¬†why glaciers have a blueish tinge, that vegetation above the tree line is short and scrubby, that people from the southern United¬†States¬†really use more words than are necessary to get the concept across, and that Bingo really is more fun when you’re drinking a Princess Colada while you play.¬† Also learning that it’s hard to be away from munchkin Emma for this long. “How do Americans do it?” asked the stunned Australian. He had zinc oxide and a twisted-up look of absolute bafflement on his face, as we spoke on a remote Fijian shore. I’d seen that expression before, on German, Swiss and British travelers. It was the kind of amazement that might greet someone who had survived six months at sea in a rowboat. The feat he was referring to is how Americans manage to live with the stingiest vacations in the industrialized world — 8.1 days after a year on the job, 10.2 days after three years, according to the Bureau of Labor Statistics. The Aussie, who took every minute of his five weeks off each year — four of them guaranteed by law — just couldn’t fathom a ration of only one or two weeks of freedom a year. “I’d have to check myself into the loony bin,” he declared. Well, welcome to the cuckoo’s nest, mate, otherwise known as the United States. In this country, vacations are not only microscopic; they’re also shrinking faster than revenues on a corporate restatement. I have seen similar looks from Germans and Austrians. Looks of pure bafflement and even disgust, when they hear about our tiny national notion of vacation time. But for better or worse, I am the product of American culture. My words from last year are still ringing in my ears. I took ten weeks of maternity leave last year when Emma was born. I felt very fortunate to have ten weeks off (and paid, at that). Lots of women in this country have no such luxury. Maternity time is often unpaid, and limited to¬†six-weeks (if their company is even large enough to be subject to relatively recent six-week federal and/or state requirement). My company’s policy is that a new parent can take up to twelve weeks off, but the last two weeks are unpaid. Well, that long anticipated week (really 8 days) of vacation is nearly upon me. It’s the first time Paul and I will have had this much time alone, away from home, since our simple Wisconsin-cabin honeymoon (which began seven years prior to our vacation departure date). But sadly, it’s not yet been feeling guilt-free, although I suspect this may change once I’m at sea in the international waters off the coastline of the 49th state. Or heck. Once I’m on the way to the Milwaukee airport, even. I spent several wee hours awake last night – anxious about all the deadlines, the uncompleted projects, the client e-mails wanting, wanting. Every client wants something. And they want it now. At the same time that ten other clients want something now. I know that it will be healthy to just escape from it all for a while. But the poor cats will be boarded. And will Emma miss us while she’s while her three local grandparents divide up the childcare duties over the week? Will they know how to soothe her back to sleep at 1:30 and maybe 3:30a.m., while I’m sleeping soundly, all night through, for seven nights in a row? Well, hmmmpphhh – let the clients want. They’ll still be there when I return. And Emma and the cats and I will have a wonderful reunion (followed by a one-year birthday party!) when we return. I suppose that if George W. Bush can take a 9-day vacation (which is short, for him) while the Middle East slides further into wars and more wars,¬†then Milwaukee will be alright without me around for eight short days…. 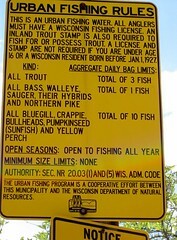 Urban Fishing RulesOriginally uploaded by Koog Family. The lawyer in me appreciates a finely coordinated set of codified rules, but knows that they are rarely either coordinated or enforced. The libertarian in me knows that that a society that imposes too many rules, as our prolific governments do today, at all levels, simply causes, by definition, widespread rule-breaking. And so, I find these signs in the park mildly amusing but quietly unfortunate. A majority of the people who frequent this park don’t speak English natively, if at all. 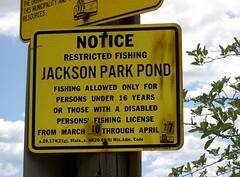 So the laws announced in these signs result in the creation of multiple violators – citizen and otherwise. I have to find the quote I’ve bookmarked at work – it cites Plato on how prolific legislation is a sign of a society in decline. Notice in the ParkOriginally uploaded by Koog Family. The rules on these signs may have been better observed at the time of their original drafting. But today, I fear, they are reminders that our country is sliding toward lawlessness as simple a result of suffering under too many laws. According to a recent report, Supreme Court Justice Clarence Thomas’s biography is in the works and will be available in 2007. The gist of the reported story is that Thomas is delayed in producing the manuscript and that the book was supposed to have come out in 2005. I wonder what “everything” means, to an agent. I suppose it could mean his opinion on his Senate Confirmation hearings or the Anita Hill testimony, a response to that bizarre accusation involving something about a pubic hair and a coke can, or, more likely, a personal account of his life experience of growing up in poverty, only to end up with a life appointment on the highest court in the land. Who knows – maybe, if he’s feeling especially comfortable with himself, he’ll tackle the pop-culture portrayal of him as something of a judicial benchwarmer; an intellectual lightweight at best, and a Scalia-loving coat-tailer, at worst. That’s all fine and good. I wish the agent, the publisher, and the alledgedly curious public all the best with that. But I’ve got some real dish on Thomas that I’m sure won’t even make it into the first draft. It’s not as sensational or headline grabbing as the ‘poor boy makes good’ or ‘judge abuses power’ narratives associated with his nomination. But to me, it is perhaps more revealing and unsettling. I used to be horrified by the information that I am about to share. But more recently, I’ve found a way to find some amusement in it. You see. I met Clarence Thomas one day, in 1997. And we had a little chat. But before I get to what we talked about, a little background is in order. In the summer of 1997, I was a grad student trying to make a few extra bucks while simultaneously living out some ill-conceived bohemian adventure. 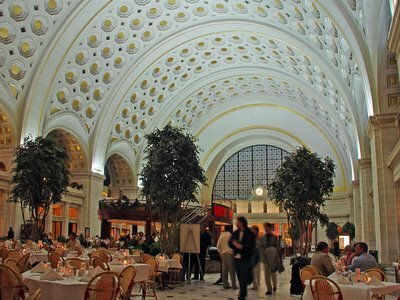 Being a sucker for beautiful buildings (and workplaces near my then-boyfriend’s, Paul’s, apartment), I tried my hand at food service at “America Restuarant” in Washington DC’s beautiful Union Station on Capitol Hill. Here’s a great picture taken from inside the restaurant. It shows the location of some of the very tables I used to wait on. There were also three four other levels of tables inside the sprawling place, plus dining areas outside. Located above a main metro line, and in a building that is, itself, a tourist detination, the clientele of the restaurant consisted primarily of tourists. Exhausted or anxious, with Wisconsin lilts or southern drawls, easy going eaters, uptight food refusers, people who walked out without paying, people who wouldn’t leave, people who thought I was a lovely young lady, and people who accused me of bigotry for not serving their food more promptly, spanish-speaking dishwashers and chinese speaking, malaysian busboys, an alcoholic waiter, a possible genius waiter, a crack-using waitress, and a young flirtatious waitress who kept flirting with me – I saw a little bit of it all in my five or so months at that place. Now, 1997 was an interesting summer to be a waiter (to use the non-gender-specific term) in D.C. You see, mayor Marion Barry had been spreading a bad vibe in the food industry just then. It had been reported in the July issue of Washingtonian magazine that he had dined at an upscale seafood restaurant and left only a $5.00 tip on a bill of $100.00. The magazine had actually published a photo of the receipt documenting this dastardly deed, and reports of the incident were being widely repeated in the local press. In my restaurant and others, conversation about Mr. Barry turned to speculation about how the coverage of bad tipping would affect his, and other notables,’ reataurant behaviour. It was during this time that, one day, a mananger told to me report to a table in the alcove. The alcove was an isolated part of the restaurant; a narrow, second-level galley of just a few tables – popular with those who preferred to dine in more privacy. The wife of the Maryland governor was a frequent visitor. And Steven Spielberg had dined there that summer, too. Diners in the alcove sat under the lofty spandrals of the side arches of Union Station’s grand hall. It’s architecture is just visible in the middle of the right edge of the photo, above. By the time I arrived, the busboy and bartender were whispering “Clarence Thomas,” excitedly. I entered the alcove, and there was Justice Thomas at “my” table, all right. He was accompanied by a younger man, who seemed rather deferential. Could have been his law clerk? I ran through the specials. But I remember that he ordered from the menu – a Shrimp Jambalaya dish. And yes, her ordered a Coke. But luckily, that pubic hair thing was not in my memory banks at the time. (Afterwards, that was all people wanted to ask about). I hadn’t yet had the idea of applying to law school – in fact I was still waiting to hear about being hired at the National Gallery of Art. I know I would have had a different approach to him had it crossed my mind that I might ever practice law. (I did very quickly debate calling him “your honor” when I took his order, but fortunately, I settled on “Sir”). As it was, though, me being a starving art historian wannabe, and all, I was really just more interested in how in the heck this man was going to tip me, after the meal was finally over. Me: From the story of that name by Dr. Seuss. CT: I must have missed that one. Me: Theodor Geisel. The children’s author. At this point, I think he said something about the tie being nice or funny, and I have a vague memory of his dining guest jumping in with something at that point – probably trying to make the boss look good. But I will never forget my shock – no, alarm! – at the realization that this man, this man who holds one of, arguably, the most powerful nine seats in our system of government, could be so out of touch with what I thought was a universal touchstone of our shared culture. I mean Dr. Seuss, for God’s sake! The man hadn’t heard of Dr. Seuss!!! As I processed this knowledge in the next hours and days, I tried to give him some benefit of the doubt. OK, I knew that he had grown up in extreme poverty in the South. I wouldn’t expect that he had access to Dr. Seuss books then – heck, they probably weren’t even written then. I don’t know. But the man has had a child! A child who attended the Virginia Military Institute. How do you have a child born in anything near my generation and miss out on Dr. Seuss?! The very idea of it disturbed me deeply. It hadn’t been so many years, at that time, since Bill Clinton endeared himself to the MTV crowd by indulging a question about boxers versus briefs. But here was a man who had the power to make decisions that could directly affect me, and had not the first clue about the Cat in the Hat, Green Eggs and Ham, or Freaky Friday? I know it seems strange that one of the things I expect from government types is that they have heard of the same childrens’ stories I have, but the realization that he certainly hadn’t struck me as a form of benightedness that could only result in oblivious, insensitive, and – yes, even harmful, -out-of-touch judicial rulings. My horror about his ignorance lingered with me for several years. Once I got to law school, I recounted the incident to any law professor or student who would listen. And I did the same once I finally started working as a new attorney. But I’m an older, wiser woman now. My former co-art-historian-wanna-be, turned husband, turned part-time law student was talking in the car this morning about a judicial dissent authored by Thomas. And out of this conversation came today a whole new way of looking at the Justice’s Dr. Seuss obtuseness. How did Clarence “miss out” on Dr. Seuss, do you think? Here’s how: by never being around when his son’s mother read the stuff to him. Have I grown that jaded, that cynical about what I expect people to know, in general? Whatever the reason, I no longer really care if the CT knows about Dr. Seuss or not. I now get a lot more pleasure simply imagining what his wife must think of being married to such an apparently sheltered guy. When commentators recently pointed out that Thomas has never, in a single opinion, addressed the Equal Protection Clause, did she make him sleep on the couch for a week? When his jurisprudence is called “rigid,” does he have to take her turn at doing the litter box? I guess I’ll never know. I’m sure that won’t be in the memoirs, either, no matter if he does have until 2007 to finish them. Because I know that the guy was stumped by Green Eggs and Ham.